If you live near either coastal ocean or near the Great Lakes, you may want to try fishing for salmon. Salmon grow to large sizes -- 30 lbs in the Great Lakes, near 100 lbs in the Pacific Ocean -- are great eating, and are strong fighters, testing even the stoutest of tackle. They can be caught from deep water from a boat through the warmer months. Trolling is the most successful approach at these times. During cooler weather, salmon can be caught in rivers, harbors, piers, creek mouths, and even the shore. Please read on for a comprehensive discussion of salmon fishing tips. Salmon are a cold-water family of andromonous fish, spending most of their lives in the ocean. Near the end of their lives, after three or four years, they make massive fall migrations into freshwater tributaries to spawn. After spawning, the fish die. Pacific Ocean salmon include Chinook, chum, coho, pink, and sockeye. Chinook are the largest of the salmon, and individuals over 100 pounds have been netted in the ocean. Their Great Lakes counterparts grow to around 30 pounds, though in both instances the average is less than half that. To the east, Atlantic Salmon are also caught in both the ocean and freshwater tributaries. Pacific Salmon were successfully stocked in the Great Lakes in the mid-1960s. There were earlier attempts at stocking -- these all failed. 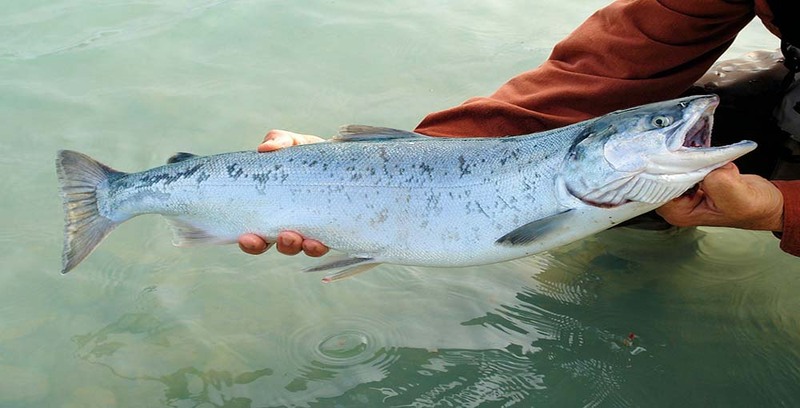 Coho was first introduced into tributaries to Lake Michigan, then, later, Chinook was stocked. This led to a boom in sports fishing throughout portions of the Midwest. Lake Michigan currently receives around 3 million stocked salmon per year. Though Chinook salmon populations are down in the Great Lakes, they can still be caught. Much like their ocean counterparts, the Great Lakes salmon spend most of their lives in the lakes, chasing forage fish. In the fall, sexually mature adults -- those three or four years old -- move into tributaries to spawn. Salmon fishing can be considered in two seasons. The second is the fall migration; the first is the remainder of the year. Salmon spend most of their lives in schools following bait fish in the ocean or Great Lakes. The only way to reliably catch salmon at this time is through trolling -- actively searching for schools of bait fish. Salmon tend to eat bait fish found near the thermocline. A dipsy diver is a disk-shaped attachment secured directly to a best braided fishing line. A lure is run a short length off the diver. When engaged, the dipsy diver pulls at a downward angle. Line counter reels are used. Knowing that, say, every 50 feet of line results in 30 feet of depth, anglers can adjust the depth of lures accordingly. When a fish strikes or an angler sets the hook, the diver disengages. The diver then stops its downward pull. There are several types of lures that fishermen use to catch salmon. The most common are large spoons, made by a variety of lure manufacturers. The size should imitate the local forage. A dodger and fly is another common lure. Minnow-imitating plugs can also produce. Remember, finding the depth of the fish is most important. Find the correct depth first, then adjust lure shape, color, and size. During warmer weather, a thermocline forms in many bodies of water. A thermocline is a thin layer that separates the warm, upper layer and cool, bottom layers of water. Often, small insects become trapped in the thermocline, attracting bait fish. In turn, bait fish attract schools of salmon. Lures should be presented in, or slightly above, the thermocline. You’ll be able to find the thermocline as a faint line on the graph of your fish ﻿﻿finder. As the water begins to cool, salmon travel large distances, staging at river mouths. This happens in late summer, and into the first cool nights of fall. This marks the beginning of the salmon spawning migration. This is also the first opportunity for shore anglers to catch them. Around 55 degrees, salmon move into the tributaries, looking for suitable spawning habitat. Salmon usually stop and congregate below barriers, such as waterfalls and dams. The last days of summer present anglers their first chance to catch salmon from shore. Breakwalls, river mouths, and piers draw anglers to the Great Lakes. Successful anglers throw spoons, such as Little Cleos and Kastmasters, and minnow baits. Others use bottom rigs with either spawn or night crawlers. Long, limber rods, medium lines, and high-capacity spools are a must for making long casts. They’re also essential for tiring these hard-fighting fish. When hooked, it’s typical for the salmon to make several drag-screeching runs of 100 yards or more. In the lower sections of the Great Lakes and ocean tributaries, especially the larger rivers, salmon are frequently taken with the same tackle used by shore fishermen. Large spinners also produce. Some anglers use little weight and drift spawn along the bottom. As the salmon move closer to their spawning grounds, they become less aggressive and harder to catch. When salmon inhabit shallow sections of the river, fly-fishermen have varying degrees of success catching them. Long 8 to 10 wt. rods and tippets of about 8 lb. test are typical. Fly fishermen either swing streamers or wooly ﻿﻿buggers in front of fish or bump bottom with small egg patterns. Salmon tend to stack up in the slack water beneath spawning gravel. They can also be found along current seams. If you’re going open-water fishing any time other than the cold-water period, you’ll need access to a boat designed for big water. A large outboard is necessary for covering lots of water to find fish. Downriggers, dipsy divers, an assortment of spoons, minnow plugs, and dodger/fly combos are equally necessary. Anglers fishing from boats should use stout trolling rods, spooled with at least two hundred yards of 12 - 40 lb test line. Line counter reels, combined with dipsy divers, give fairly precise depth control. A net simplifies landing fish from a moving boat. A best fish finder GPS combo allows anglers to search the water for schools of salmon and Mark productive spots. Besides necessary tackle for fishing, accessories can make fishing more enjoyable. Pliers are a great help in removing hooks. Diagonal cutters can cut through steel hooks. If you’re keeping fish, and you should, a large cooler filled with ice is best for storage. A filet knife is required for removing fillets. A first aid kid is a must when in the presence of hooks. 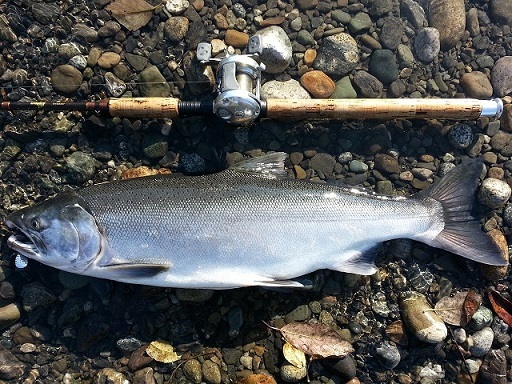 Shore fishing tackle for salmon involves long, limber rods. High capacity spools, with 200 or more yards of 8-12 lb test allow for long casts. Snaps make switching between lures a breeze. Bait fishermen need stout hooks and enough lead to hold bottom -- in some cases an ounce or more. There are more than a few options for shore fishing lures. Lipless crankbaits retrieved fast work for aggressive salmon. Spoons such as Kastmasters and Little Cleos from 2/5 oz and heavier cover lots of water. Popular colors are blue/silver and gold/red. Long minnow baits such as Rapala don’t cast as well but take more than their share of fish. Shore fishing for salmon begins in late summer and continues through the much of fall. As a result, rain gear, boots, and warm gloves help keep anglers comfortable in blustery fall conditions. A long-handled, collapsible net is required for landing salmon from break walls and piers. For anglers that want to target salmon with a fly rod, simple outfits are usually best. Long fly rods in the 8 to 10 weight class work well for delivering small egg or streamer patterns along the bottom. Spey rods are popular for swinging streams across the current in front of salmon. Wading for salmon is an exciting way to target big fish in shallow water. It does, however, require special attention to safety. Wading in fall requires waders insulated against the cooling waters. A wading staff and boots with studs ensure footing. An inflatable life vest ads another layer of safety. Salmon are voracious predators, grow to large sizes, and provide excellent eating. Salmon are found along tributaries of both coasts and provide great sport in the late summer and early fall. Though the Great Lakes salmon fishery is currently in decline, success still awaits determined angler. This article has been filled with salmon fishing tips to help ensure your fishing success. Thanks for explaining how you can fish for salmon. You mentioned that you should find the correct depth first and then adjust the lure for the fish. It sounds important to know the area really well so you can have the right gear for catching salmon.